Researchers have discovered yet another way to harvest small amounts of electricity from motion in the world around us – this time by capturing the electrical charge produced when two different kinds of plastic materials rub against one another. Based on flexible polymer materials, this “triboelectric” generator could provide alternating current (AC) from activities such as walking. The triboelectric generator could supplement power produced by nanogenerators that use the piezoelectric effect to create current from the flexing of zinc oxide nanowires. And because these triboelectric generators can be made nearly transparent, they could offer a new way to produce active sensors that might replace technology now used for touch-sensitive device displays. The research was funded by the National Science Foundation, the Department of Energy and the U.S. Air Force. Details were reported in the June issue of the journal Nano Letters. In addition to Wang, authors of the paper included Feng-Ru Fan, Long Lin, Guang Zhu, Wenzhuo Wu and Rui Zhang from Georgia Tech. Fan is also affiliated with the State Key Laboratory of Physical Chemistry of Solid Surfaces at Xiamen University in China. The triboelectric generator operates when a sheet of polyester rubs against a sheet made of polydimethysiloxane (PDMS). The polyester tends to donate electrons, while the PDMS accepts electrons. Immediately after the polymer surfaces rub together, they are mechanically separated, creating an air gap that isolates the charge on the PDMS surface and forms a dipole moment. If an electrical load is then connected between the two surfaces, a small current will flow to equalize the charge potential. By continuously rubbing the surfaces together and then quickly separating them, the generator can provide a small alternating current. An external deformation is used to press the surfaces together and slide them to create the rubbing motion. The technique could also be used to create a very sensitive self-powered active pressure sensor for potential use with organic electronic or opto-electronic systems. The force from a feather or water droplet touching the surface of the triboelectric generator produces a small current that can be detected to indicate the contact. The sensors can detect pressure as low as about 13 millipascals. While smooth surfaces rubbing together do generate charge, Wang and his research team have increased the current production by using micro-patterned surfaces. They studied three different types of surface patterning – lines, cubes and pyramids – and found that placing pyramid shapes on one of the rubbing surfaces generated the most electrical current: as much as 18 volts at about 0.13 microamps per square centimeter. Wang said the patterning enhanced the generating capacity by boosting the amount of charge formed, improving capacitance change due to the air voids created between the patterns, and by facilitating charge separation. 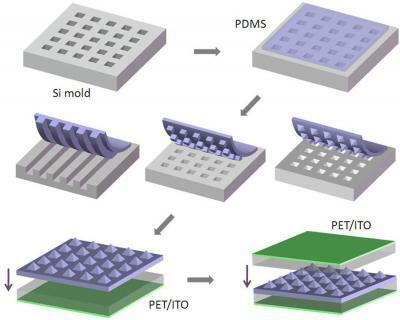 To fabricate the triboelectric generators, the researchers began by creating a mold from a silicon wafer on which the friction-enhancing patterns are formed using traditional photolithography and either a dry or wet etching process. The molds, in which the features of the patterns are formed in recess, were then treated with a chemical to prevent the PDMS from sticking. The liquid PDMS elastomer and cross-linker were then mixed and spin-coated onto the mold, and after thermal curing, peeled off as a thin film. The PDMS film with patterning was then fixed onto an electrode surface made of indium tin oxide (ITO) coated with polyethylene terephthalate (PET) by a thin PDMS bonding layer. The entire structure was then covered with another ITO-coated PET film to form a sandwich structure. “The entire preparation process is simple and low cost, making it possible to be scaled up for large scale production and practical applications,” Wang said. The generators are robust, continuing to produce current even after days of use – and more than 100,000 cycles of operation, Wang said. The next step in the research will be to create systems that include storage mechanisms for the current generated.